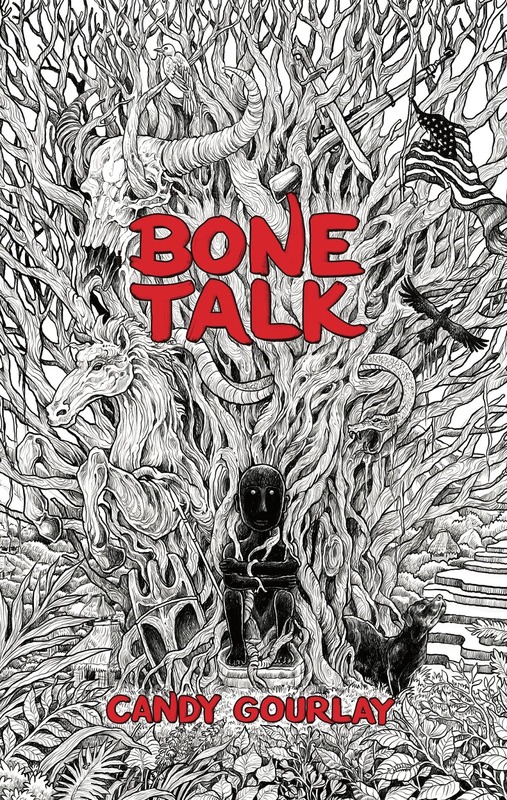 My third novel, Bone Talk, hits the shops today! Copies have been spotted in Japan and some bookstores have already shipped books out, though Amazon Kindle has been steadfast in refusing to allow downloads until today. Me, I'm just glad it's out in the wild at last. 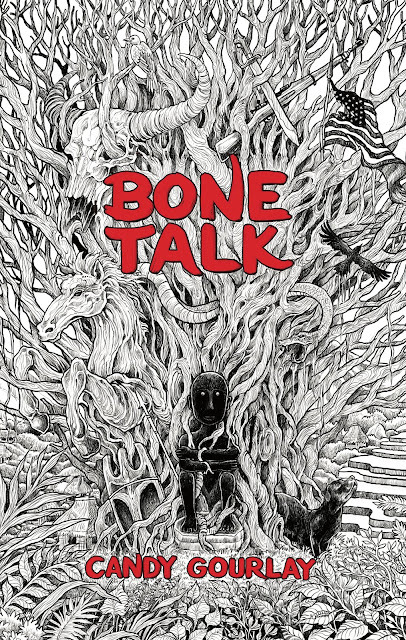 I am so grateful for the relentless support of friends and strangers who've been talking up a storm about Bone Talk these past few days. Thank you, guys! And thank you, David Fickling Books, for publishing it! On this auspicious day, here are some fun facts about the book and its making! ... and his glorious colouring books have made it to the New York Times bestselling lists! 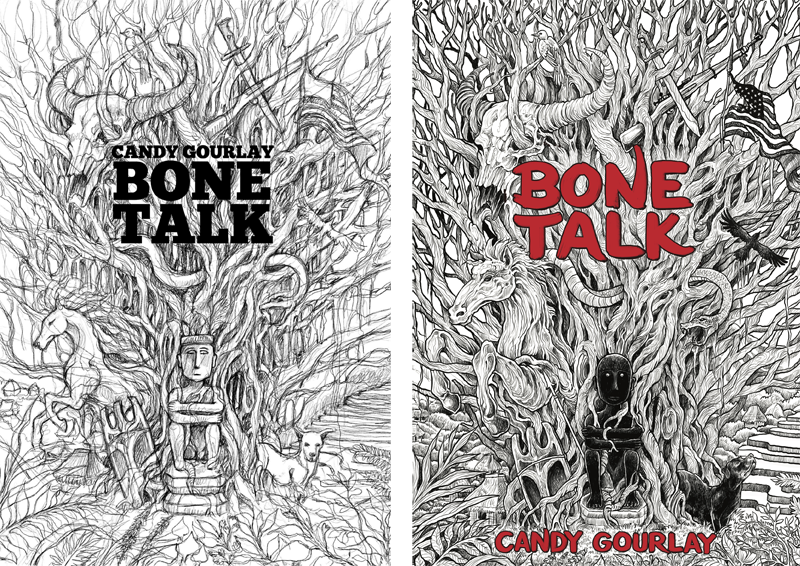 I emailed the team at my publisher DFB, hinting strongly that Bone Talk should be fully illustrated by Kerby. When it turned out that they'd commissioned Kerby to do the cover, I was over the moon! The first I knew that Kerby was doing the cover was when my editors sent me the rough on the left! 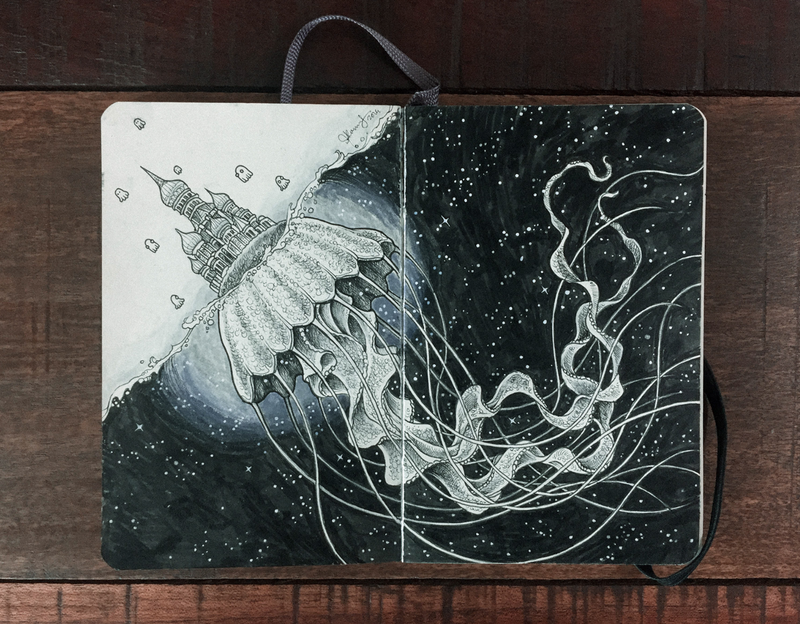 The final version is on the right. For a long time, the working title of the book was The Tree of Bones, which somehow didn't feel right. I was relieved and happy when my agent and I thought up Bone Talk. It makes sense in terms of the narrative, but it's also a secret joke for Filipinos. The setting of my story is a village in a place called Bontoc, in the highlands of the Philippines. 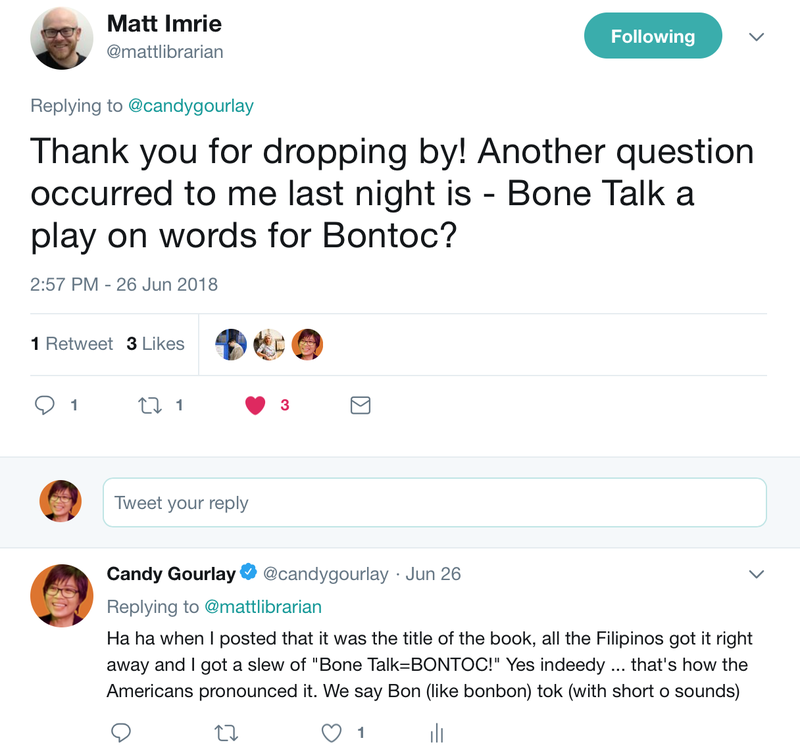 Bontoc is not an easy word for the Western tongue to wrap around and invading Americans pronounced it "Bone Talk" ! When I announced the title on social media, my fellow Filipinos got the joke immediately! Librarian Matt Imrie smelled the rat too. You can't hide things from a good librarian! 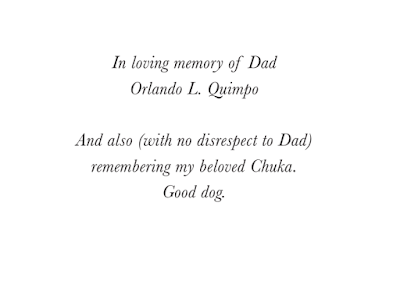 When my children first opened early proofs of the book, they exclaimed, "You dedicated it to YOUR DOG???" 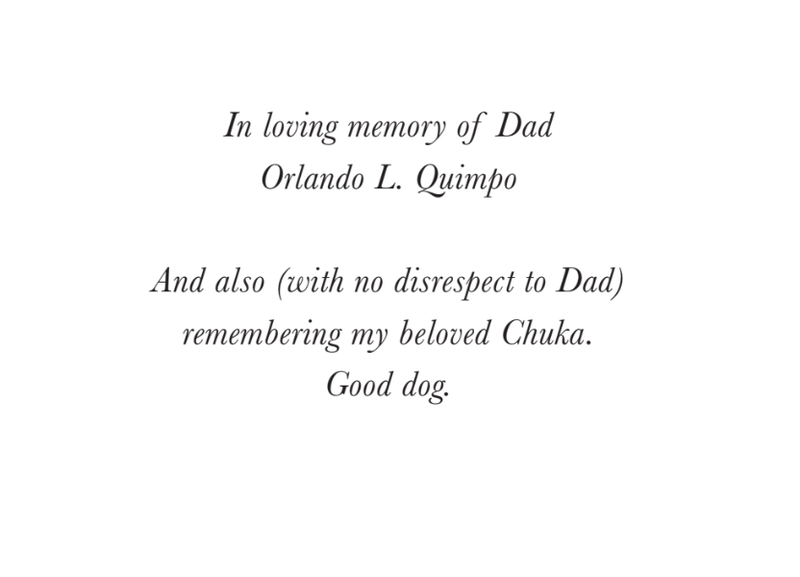 Well ... yeah ... but FYI, I also dedicated it to my dad, and Dad's name came first! 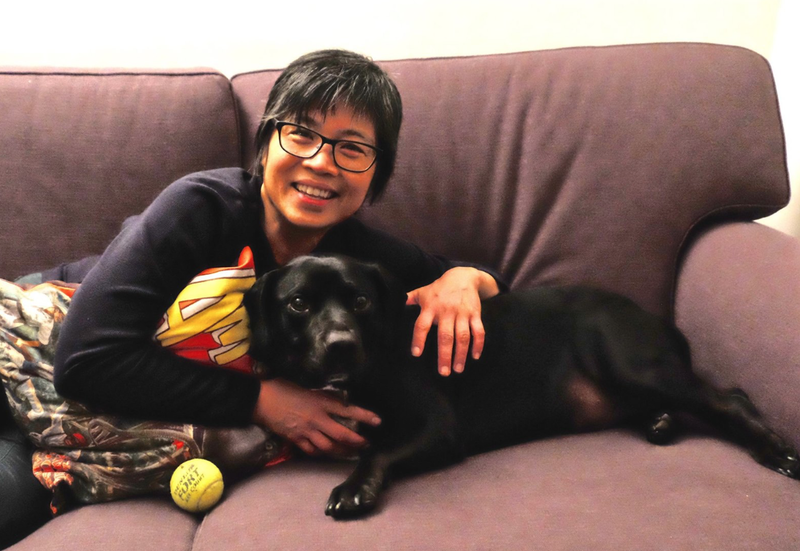 • the real Chuka - who was the soppiest dog alive but became a growling, teeth baring monster when she met the man who became my husband. She knew he was going to take me away forever. • Harvey, bookshop dog at Jo De Guia's Victoria Park Books, sadly now closed. We borrowed him for a few days one Christmas and it seriously hurt so much when we had to hand him back. Harvey. Photo by Mia Gourlay. • Kunig (who gets a mention in the Acknowledgements), a mountain dog I met in Bontoc while researching the book. Kunig had a herding instinct and herded us along the narrow trails of the paddy fields. From faraway London, I used Google Earth, old maps and the diaries of turn of the century travellers to research the place. I also read a lot of Filipino travel blogs to see if I could get a more vivid picture of how the region looked now. I noticed that two travel blogs kept mentioning Maligcong, a quiet village off the tourist trail. It sounded like the perfect location for my story. The blogs were Lagalog by Oggie Ramos and Ironwulf by Ferdz Decena. Soon after I finished a first draft, I finally visited Maligcong and ... surprise! Oggie and Ferdz were staying at my homestay! Turned out the reason they were constantly mentioning Maligcong was because they had a real passion for the place. Being physically there was wonderful. I realised that I had been exclusively visual in describing the setting. In fact, at the Maligcong rice terraces there is a constant rushing noise of water around the rice paddies, the farmers tilling the terraces chat and banter, the water buffalos snort in the mud and there are small fishes and crabs in the paddy water. 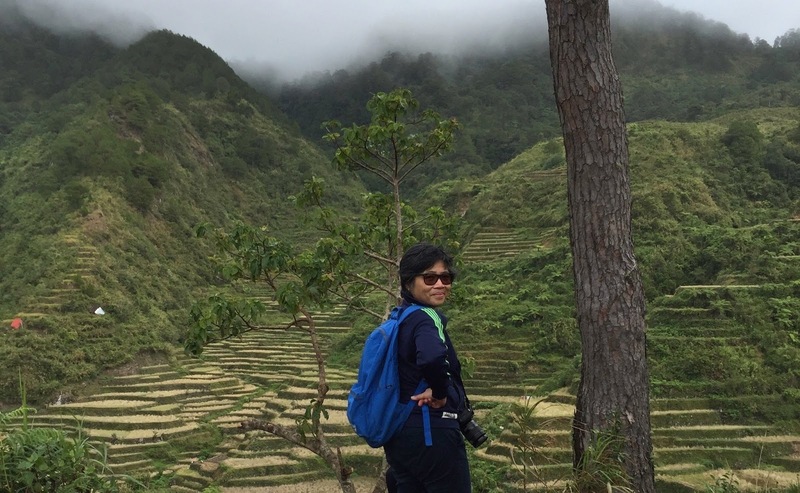 My characters are a headhunting people that lived high up in the Philippine Cordillera. They are called Igorots, a name coined by Spanish settlers who came to colonise the Philippines in the 16th century. 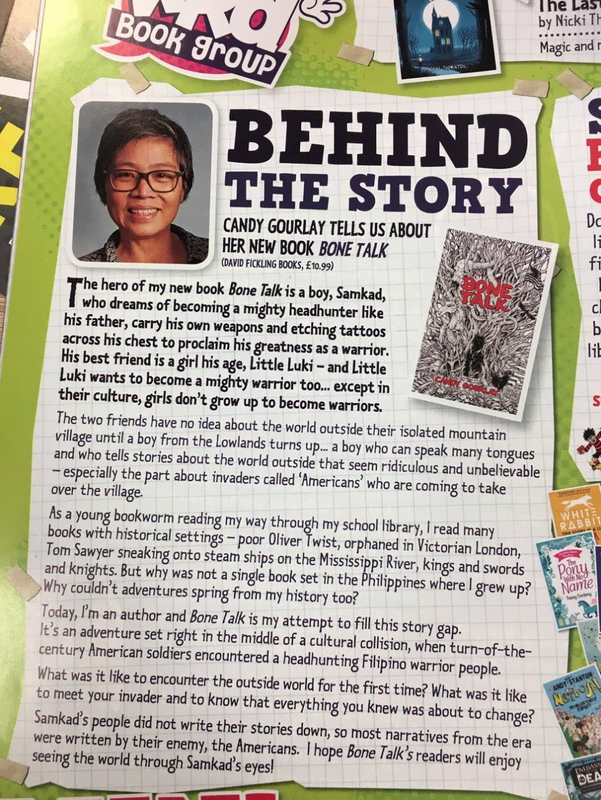 But I do not use the word Igorot in Bone Talk, which might initially surprise or even disappoint Igorots, who take great pride in their heritage. In 1899, the year of my story, Igorot would have been a word used by outsiders, not by the mountain people themselves. The word 'Igorot' has a fraught history. In the early 16th and 17th centuries, it was simply a general term to refer to mountain dwellers, whatever their cultural group – of which there were many, many diverse communities up and down the Cordilleras, each with their own languages, belief systems and cultural practices. Spanish colonisers soon exerted dominion over most of the Philippines – but they failed to conquer the people of the Cordillera mountains, who resisted their every effort to conquer them. There would be brief interludes when a small community might pay tribute to Spain and allow a garrison to be built amongst them. But such times did not last long. The mountain people soon pulled up stakes, melting deep into the mountain jungles. The Spanish never grew their own food so they dared not give chase and stray too far from supply lines from the lowlands. The Spanish become frustrated and embittered by the failure to conquer the mountain people. Their dispatches to Madrid disparaged the Igorot with more and more vehemence, and soon the word 'Igorot' became derogatory, with connotations of impurity, savagery and backwardness. Sadly, Spanish badmouthing was absorbed by other Filipinos and Igorots have for years endured discrimination from their compatriots in the lowlands. 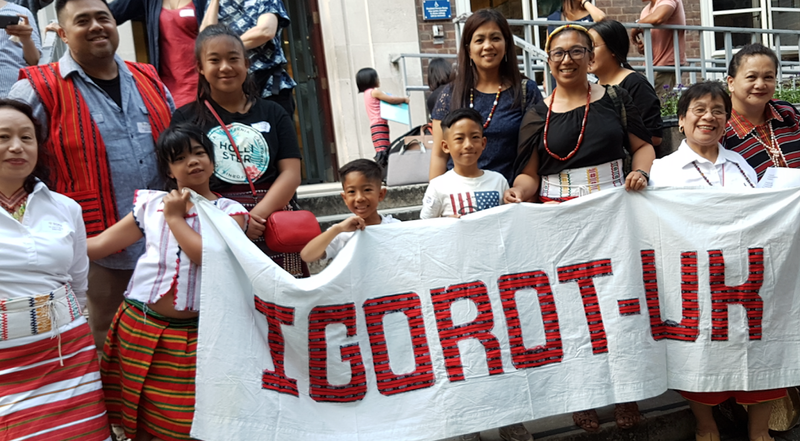 In the past few decades however, Cordillerans have chosen to appropriate the word and proudly identify themselves as Igorot – though a few groups still resist the word. There is a myth that the Spanish failed to conquer the Cordilleras because of the terrain and isolation of its peoples. But historical records reveal a lively interaction and trade between mountain folk and the lowlands. The truth is: the Spanish failed to conquer the Cordilleras because the people of the mountain didn't allow themselves to be conquered. My book launch was part of a two day conference on the Cordilleras at the School of Oriental and African Studies (SOAS) – I took this video of UK-based Igorots in native dress performing at the conference. So yeah, my characters are a headhunting people. Fact. But would this be off-putting to my readers? Worse, would it be offensive to the people of the Cordillera themselves who, during my research trips, gave me the impression that they wanted to put headhunting firmly into the distant past. Whenever I tried to ask anyone about headhunting in the Cordillera, I was gently reminded that headhunting had been outlawed back in the American occupation. When I visited the Bontoc Museum in search of headhunting artifacts, I found them displayed in the bottom shelf of a glass cabinet in a remote corner of the museum. The message I got was this: headhunting is something that savages do, and we are not savages - understandable when you consider that Igorots have endured being belittled as primitives for centuries. But I needed to understand what the practice meant so that I could find a truthful yet sympathetic way of representing it in my story. When I read Severed by Frances Larson, I heaved a sigh of relief. Turns out, unshoed corners of the world do not have a monopoly on head chopping. 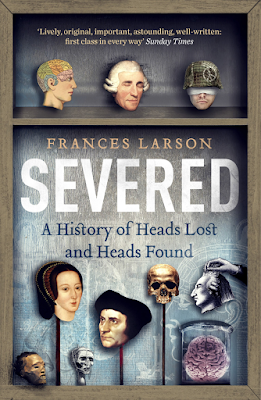 Britain, the book reminded me, has had a long tradition of severing heads. 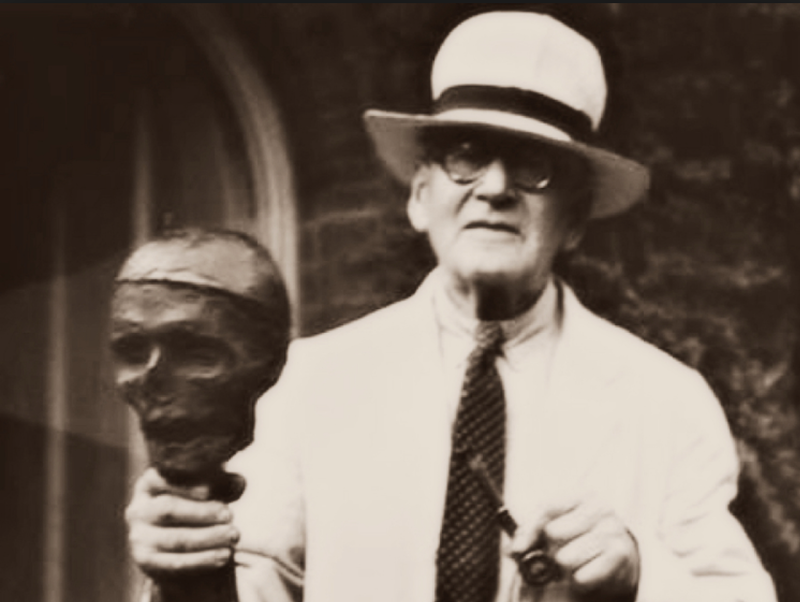 One famous head, Oliver Cromwell's, became an attraction at small freak shows. It deteriorated down the centuries, losing an ear here and the tip of its nose there, before ending up in private hands. It wasn't until 1960 that it occurred to someone to give Cromwell's head a break. It was buried in Cambridge. During World War II, Allied soldiers in the Pacific arena made a sport of taking the heads of Japanese dead, causing a scandal. According to Larson's book, 60 per cent of Japanese dead repatriated from the Mariana Islands in 1984 were missing their heads. Headhunting and headhunters conjure notions of savagery and "the moral limitations of 'savage society'". I realised that if I were to represent headhunters fairly, it would be important to dig deep and understand the logic of headhunting culture. And yes, there is logic to it. The more I explored the belief systems of the pre-Christian Igorots, the more it became clear to me that headhunting was not the act of an unthinking savage, but a deeply moral and rational practice. Bone Talk is set in late 1899, when American troops were rampaging across the Philippines to secure it as part of a package of entitlements after the United States won the Spanish American War. That victory – and the end of the Spanish empire – was sealed by the sinking of the Spanish Pacific Squadron by Commodore George Dewey in the Manila Bay. Growing up in the Philippines, we were taught the facts of history in isolation. There was no wider context. It was all about memorising dates and titles which I just about managed. But it felt like nothing to do with me, apart from the grade I had to achieve. Researching this story, for the first I woke up to the context of America's imperial ambitions. It felt like a giant OMG suddenly appeared above my head and stayed there, hovering for the duration of my research. How the Spanish American War was sold to Americans. Illustrator: Louis Dalrymple. Public Domain image. 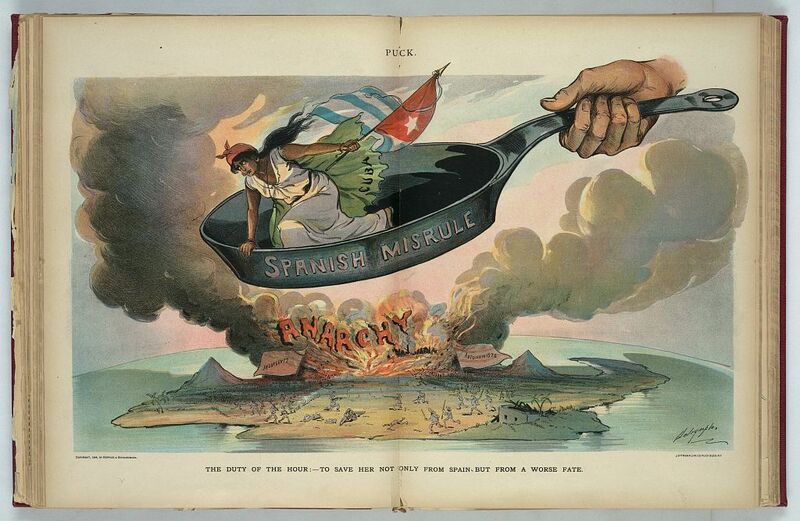 The big picture: when Spain lost the Spanish-American war, it handed over its colonies: Cuba, the Philippines, Guam and Puerto Rico. The United States designated these countries "unincorporated territories". The Philippines became a republic after the second world war ... but Puerto Rico continues to be unincorporated territory of the United States. One empire crumbled and a new one rose to take its place. The small picture: Inconveniently for the United States, the Filipinos were still in fighting mode and despite all their arrangements with Spain, America found itself fighting another war which, despite the fact that their Filipino enemy lagged behind in fighting know how and firepower, lasted until 1902 (with serious pockets of resistance continuing through till 1905). It is said that almost a quarter of the population was killed – something that should be examined and remembered. My use of the word "invasion" to describe this period may rattle some people. Our history books don’t tend to talk about America’s incursion as an invasion. But that is what it was. And it changed us, as a people, forever. Last year, I was invited to appear at the Pune International Literary Festival in Pune, India. My British husband came along and we had a wonderful time hanging out with Indian authors at the festival. At one point, sitting around the table, the conversation turned to the unsavory history of British colonialism in India. Our Indian friends knew the story of their colonial relationship with Britain, every cruel twist and turn of it ... and were not shy to recount details to my husband. 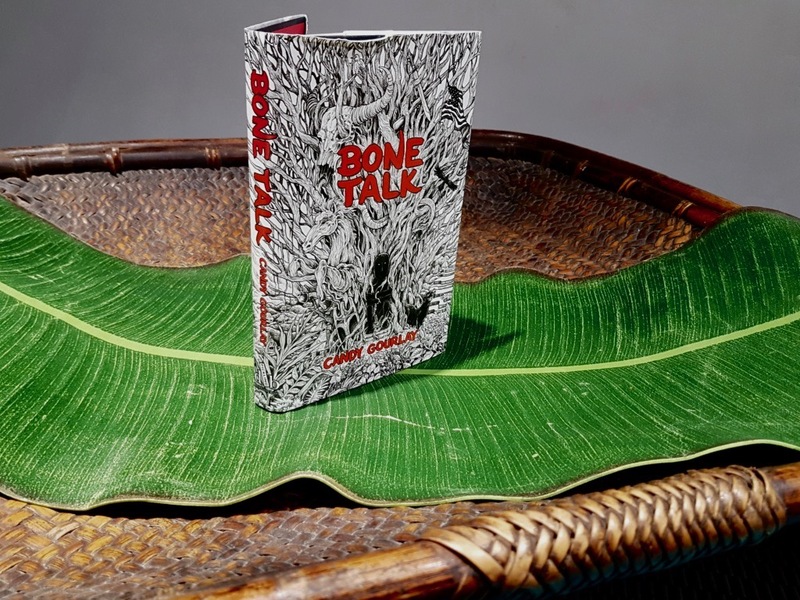 Bone Talk is fiction, but its historical backdrop is something we Filipinos will always share with our American friends. It is what it is. We cannot change what happened but we must be aware of what happened and how it changed us. I like to tell audiences that books do not provide answers but help us ask questions. I hope Bone Talk will awaken a questioning in all of us. There are still many things about that era we need to be curious about. Rich in the customs of the Bontok culture, with its paddy fields, sacrifices to ancestral spirits, and hunting and fighting with spears and axes, this fully imagines a way of life for which the records are sketchy. It also shows us a moment of change, as two worlds meet, and that it takes more than a ceremony to make a man. The culture and the landscape are vividly drawn, a mesmerising world of soulful ritual and community, rendering the impact of the American invasion all the more devastating. Gourlay is an accomplished novelist who looks to explore different challenges in every book, all springing from her own background. Here she boldly takes her readers into a very different world, a past that is both specific yet universal. 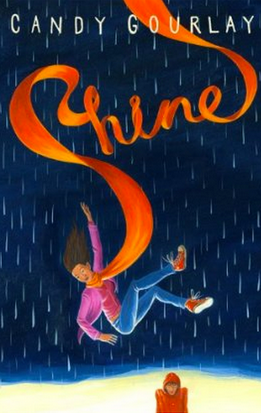 This is a book to recommend – accessible, exciting and challenging. 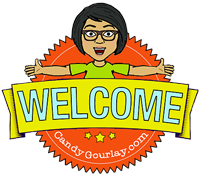 Candy Gourlay's prose takes the reader by the hand beckoning them on Samkad's journey. They will feel every stone under their feet, every whisper from the trees and every laughter and tear shed as they delve deeper and deeper into the book. Only once the last page has been read will they come up for air, wondering how they will ever read anything quite like it again. A writer in the full flow of their talent. Highly recommended. Utterly engrossing. This sumptuously realised, age-old story of colonisation transports in time, culture, landscape and history. It will lodge deep in the bone long after these pages have been turned. A wonderful novel that brings to life with passionate clarity the moment when an ancient culture comes head to head with a brutal colonial invasion. Samkad and Luki are characters who leap from the page, and will stay with me for a long time.